The other day, as random bits of past projects littered the floor and I tried to gather them up and put them away, it struck me. 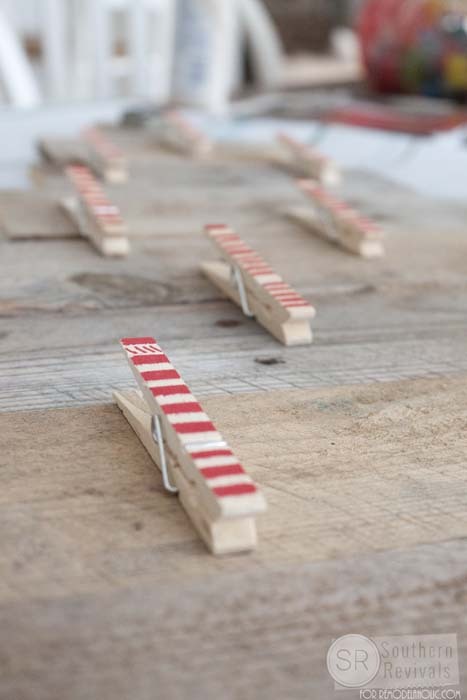 These scrap pieces of pallet wood are almost perfectly graduated in size. I wondered what would happen as I started to arrange them on my garage floor into the meaningful pattern I was sure was there. I hate to throw things away. I know it borders on hoarding but at times like this I totally feel justified. 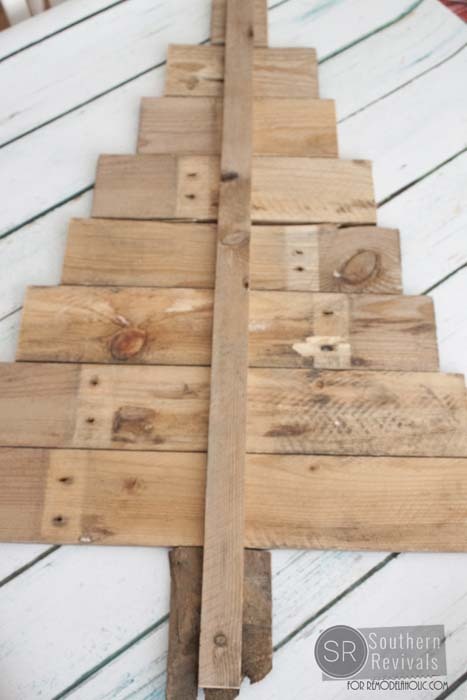 So there I sat laying out pieces of pallet board like a child laying out blocks feeling quite proud of myself when I realized I could totally make a Christmas tree out of these pieces. I didn’t know what I would do with it once I did but the pieces were practically begging to become O’ Tannebaum and who am I to refuse? 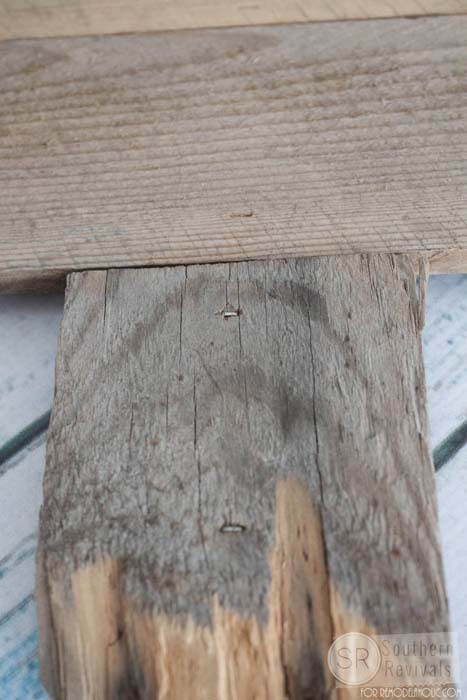 I grabbed another spare bit of cedar from those raised garden beds from last spring to attach all of the pieces to. I even thought this broken piece made the perfect trunk. I used my staple gun to attach the pieces but if you don’t have that, wood glue will do. Also, if you don’t have scrap piece stockpiled like I do these are easy cuts for your electric saw. 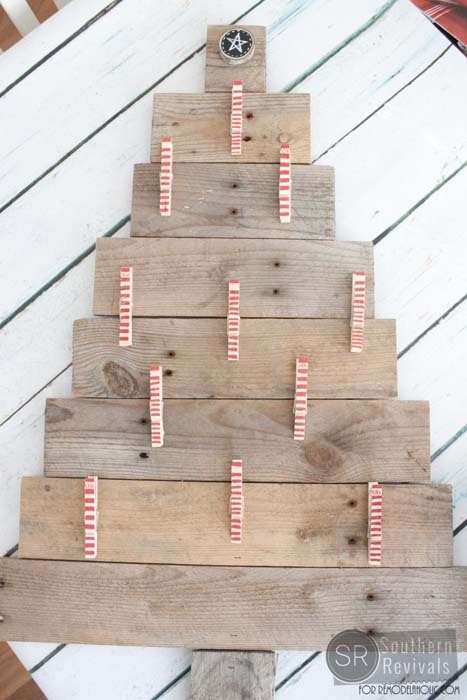 After I’d made my pallet wood Christmas tree I just kind of stared at it for the next several days. I wasn’t sure where we were going from here, O’ Tannebaum and I, but I knew it wasn’t an advent calendar because I already have one of those. Then I realized the thing I need this time of year, more than anything, is a place to display holiday photos. Maybe you are better parents than me but I must confess that I often take a lot of pictures this time of year that never see the light of day. Even ol’ pics with Santa and that’s a shame. 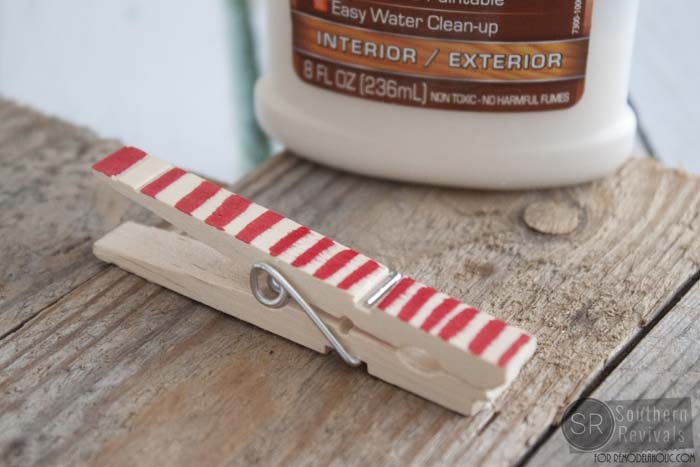 I decided I’d add some clothes pin for clipping on the pics (or Christmas cards) but any kind of clip will do. 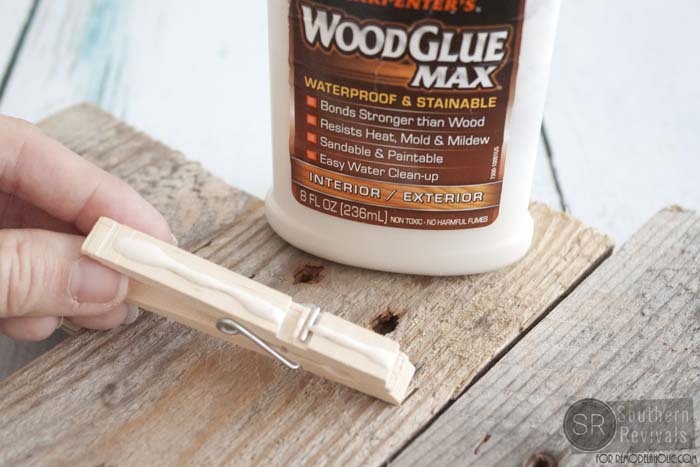 I attached mine with wood glue. I also dressed them up with a red Sharpie. I decided the top of the tree needed something so I painted a wood slice (from yet another project) with chalkboard paint and painted on a little star. 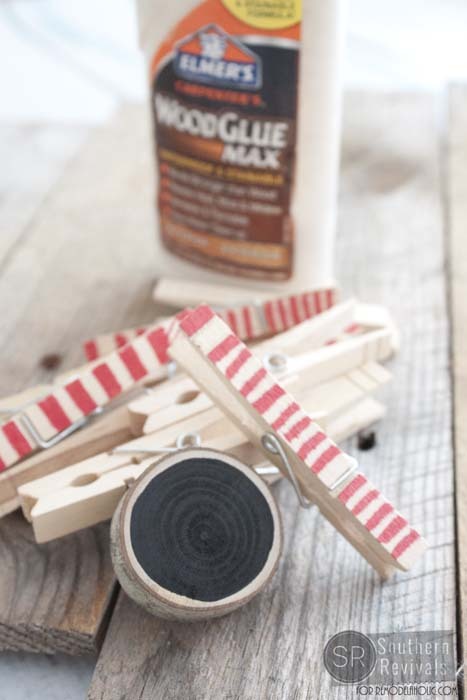 I love how the black works with the weathered wood and little pops of red. Once all of that was dry I attached a little D-hook hanger to the back and I was ready to go! 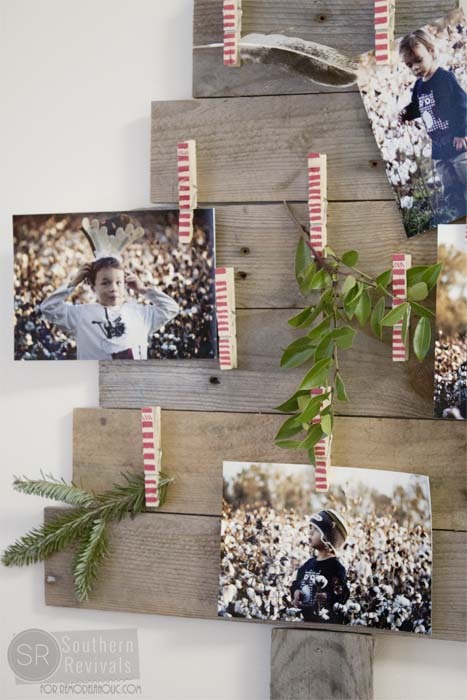 This project will take you a day, at most, and you’ll have an adorable place to quickly put your holiday memories on display. Even that rouge picture with Santa that’s still in the drawer from last year. Oh. Is that just me? And what about all of those photos you took for the Christmas card this year? 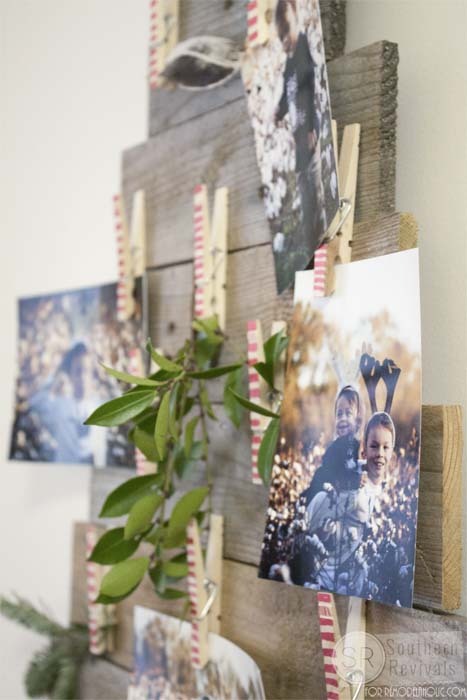 How do you display your favorite holiday memories? 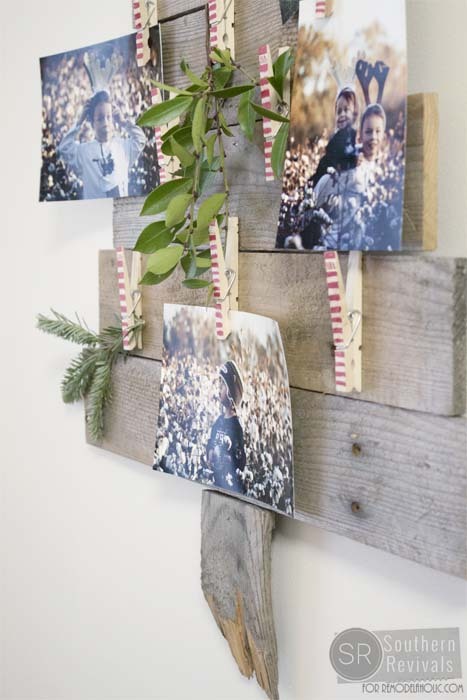 For more Christmas projects or photo display ideas please check out my DIY Advent Calendar and my Pallet Photo Frames below. 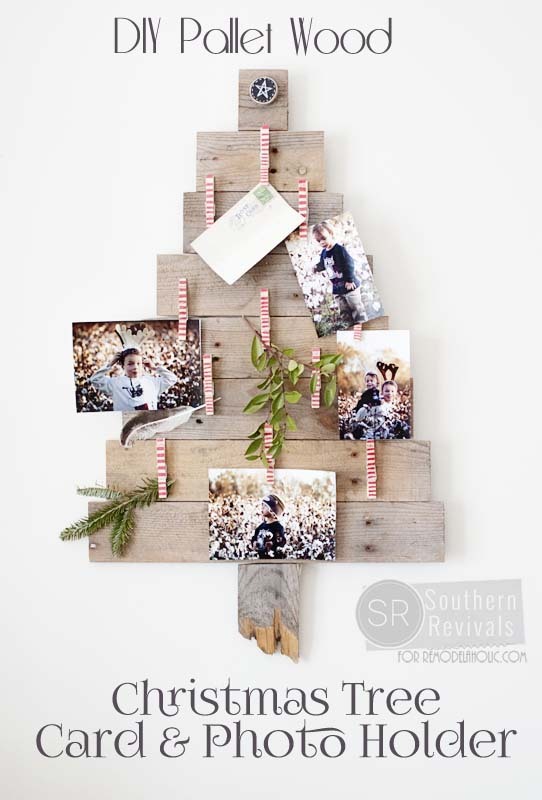 The post DIY Pallet Wood Christmas Tree Photo & Card Holder appeared first on Remodelaholic.